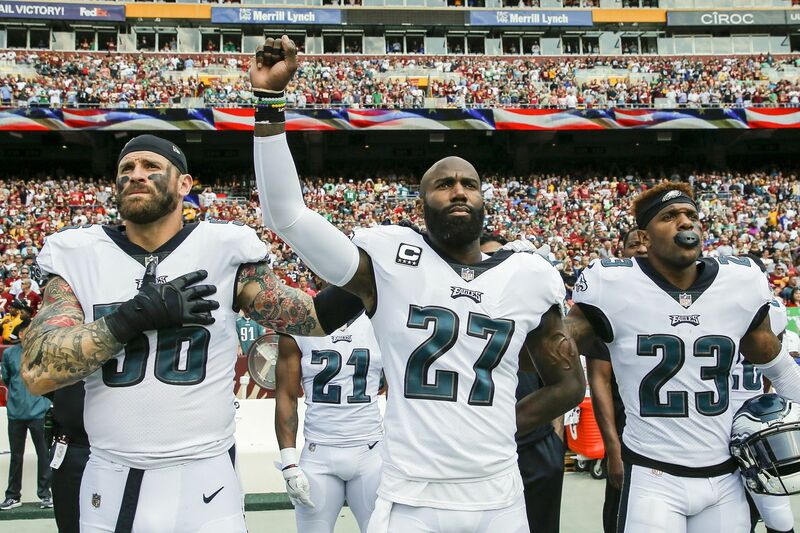 The Eagles' Malcolm Jenkins raises his fist as a form of protest prior to a game vs. the Redskins last year. He is joined by Chris Long (left) and Rodney McLeod. Malcolm Jenkins joined Lester Holt on NBC Nightly News and discussed the controversy surrounding NFL players protesting police brutality during the national anthem in an interview aired Wednesday. Jenkins echoed sentiments he has stood by since emerging as one of the leading voices for racial equality in the NFL during his time with the Eagles, and questioned why racial issues is where the NFL and some of its fans draw the line when discussing problems facing society. "At the end of the day, protests and fighting back are the American way," Jenkins said. "We can talk about social issues and still have a great game. We talked about domestic violence for a whole year. We talk about breast cancer for a whole month every year. We wear pink on the field, no issues with that. When we start talking about black issues, and issues of race, now all of a sudden 'We just want football, we don't want all that extra stuff.'" Jenkins criticized the NFL for introducing a recently suspended policy requiring players to stand during the national anthem. "They went back to talking about the flag and then anthem and having respect," Jenkins said. "When for a year and a half they've been hand-in-hand with us seeing what we've been doing in the communities." Jenkins also elaborated on why he is going away from raising a fist during the anthem. "I think that has run its course," he said. "The purpose of all of the demonstrations was to create dialogue. It's more about the work now."